(VOVworld) - The Vietnam Red Cross Society (VRCS) should organize more humanitarian and charity initiatives, former State President Truong Tan Sang said at a working session in Hanoi on Tuesday with the organization. Mr. Sang, who is also the society’s honorary president, said he hopes the organization will seek more ways to implement humanitarian and charity programs effectively. 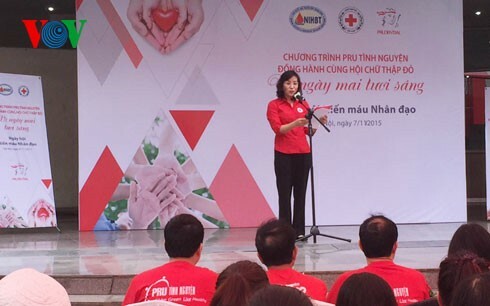 He said that in addition to the emergency supply of essential goods and necessities for flood victims in the central region, it would be better if the Vietnam Red Cross could help the people there deal with rainy and flooding seasons sustainably and minimize the consequences of natural disaster. The Society’s President Nguyen Thi Xuan Thu said that, to date, it has collected nearly 4.2 million USD from organizations, individuals, and partners at home and abroad to help 74,000 households in 15 out of 21 provinces seriously affected by drought and saline water intrusion, and 4 provinces strongly influenced by the recent maritime environmental pollution which led to mass fish deaths. The society has organized three delegations to provide emergency aid for flood-hit provinces of Nghe An, Ha Tinh, quang Binh, and Quang Tri.